The contact centre industry is normally in a state of flux – change is the only constant, even if it’s not apparent at the time. Some changes are like trends – a short-term “flavour of the month” which comes and goes. Others prove their worth and slowly become more widespread. The Lean and Agile methodology has now moved from buzzwords in the contact centre industry to core principles and practices that are dramatically shifting the way leading contact centres operate. So let’s take a look at what the lean and agile methodology is and how it can be applied in a contact centre environment. What is lean, and what is agile? If you look at the dictionary, you will see that the word agile is defined as “the ability to move quickly and easily”. This is a great way to explain what an organisation should be aiming to achieve when implementing agile into teams and organisations. Agile helps them move quickly and easily; not only in isolation but also as part of the complex systems that are now organisations. When Agile started in software development, it was described as a set of values and principles under which requirements and solutions evolved through the collaborative effort of self-organizing cross-functional teams. It advocated adaptive planning, evolutionary development, early delivery, and continuous improvement, and it encouraged a rapid and flexible response to change. 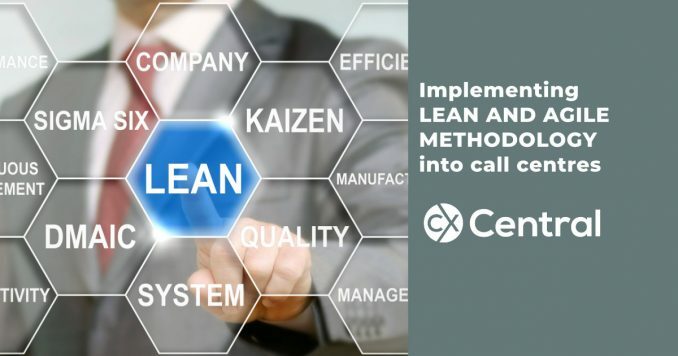 Lean started in manufacturing, in particular with the Toyota System of work. It can be summarised as creating a culture in the organisation where the focus of everyone is on eliminating waste, improving the flow of work and adding value to the customer. Why is the Lean and Agile Methodology so relevant to the contact centre industry? Eduardo Nofuentes is an Agile Enterprise Coach, and founder of The Agile Contact Centre, an agency that helps organisations to transform their contact centre operations to deliver a first class customer and work experience. “In my view, the role of the Contact Centre in an organisation is to be the link between the demands of the customers and the rest of the organisation. Those customer demands are, at large, unpredictable – we don’t know what types of calls we are going to receive – and every day is different. Agile allows you to set up a system of work that enables a rapid, adaptive and flexible response to change; and lean helps us see what we do, through the lenses of value to the customer. How do you implement the Lean and Agile methodology into a contact centre? The first thing that needs to happen is a mindset shift, especially within the leadership team. Leaders need to be prepared to do things differently to the traditional way Contact Centres have been managed. Without this mindset shift, no agile and lean transformation will work. “Once you have embraced the mindset that is required, you start implementing a new system of work based on lean and agile principles and supported by agile practices and methodologies”, says Nofuentes. “You will need to look at the way you structure your team, the way you recruit, the way you QA, the way you induct and train your stuff, the way you do your rostering, the way you reward and the targets and metrics you use. Because agile and lean are mainly human-centric approaches to work, the first thing you achieve is improved empowerment in the team that leads to higher employee satisfaction. This improved employee satisfaction helps with staff retention. This leads to higher customer satisfaction, as the quality gets better; and because the quality gets better the costs are lower. “This is an interesting paradox,” says Nofuentes, “for many years organisation saw (and some still see) their contact centres as a cost that needed to be reduced, and they applied strategies (like outsourcing) to reduce that cost. Cost can also be reduced by understanding and focusing on customer demand rather than traditional contact centre metrics (like average handling time); by working closely with the rest of the organisation in reducing the calls a contact centre doesn’t want to receive (failure demand). Why are lean and agile methodologies increasing in popularity in contact centres at the moment? Agile is spreading more and more outside software development and digital companies and is becoming a way of working for entire organisations. Businesses are seeing that if they want to remain relevant in this age of disruption they need to adapt to new ways of working. Sadly, agile is also becoming a “buzz” word. Every organisation and team wants to “be agile” and “do agile” there are a lot of “agile implementations” that don’t quite achieve the full potential by not following the mindset, values and principles of this way of working, as they only scratch the surface by implementing a couple of tools and practices. How can contact centres further explore lean and agile to decide if it’s something they want to implement? Nofuentes is clear that introducing lean and agile is not for the faint-hearted. So, what are the first steps a contact centre should take? “I think the best way is to talk to an organisation that has gone through this journey before. Talk to them about their experience, pros and cons,” said Nofuentes. In which contact centres have you implemented lean and agile methodology? Nofuentes first attempt to implement lean and agile in a Contact Centre was at the REA Group (realestate.com.au) when he was Contact Centre Manager. It was his first Contact Centre manager role, and coming into the job with completely new eyes was probably one of the reasons why it was able to work. Since then, and under the brands of the two consultancies Nofuentes has founded he has worked with many organisations both in Australia and overseas. One of the most interesting projects he is involved with at the moment is helping the support team of the e-commerce Canadian platform “Shopify” as they implement this approach with a team of 1,200 people spread across 3 different continents. Search for consultants that can help transform your contact centre in our Business Directory.